David Johnson was born in one of the Midwestern states that begins with the letter “I”. He went to public school, walked beans, detasseled corn, baled hay, worked as a bus boy, janitor, state liquor store clerk, and roofer. He built cement grain elevators on the Mississippi River, picked apples in Washington state, put together the Ferris Wheel for the carnival, worked in a K-Mart Pet and Garden Center, Sears catalog warehouse, painted houses, and fell off the Christmas tree truck. He attended the Cleveland Institute of Art and received BFA and MFA degrees in Drawing and Printmaking from a couple of different state universities. He has taught at Miami University, Anderson College, Minnetrista and Ball State University where he has instructed Printmaking and Drawing since 1988. David Johnson has exhibited his etchings, woodcuts and artist’s books in a few hundred exhibitions locally, regionally, nationally and occasionally abroad. He has received a number of awards for his work. His prints and books are in several collections including, the Boston Public Library, Special Collections at the University of Iowa Libraries, The Elvejhem Library at the University of Wisconsin-Madison, Carleton College, the University of Maine, the Nelson Atkins Museum of Art in Kansas City and the Harvard University Art Museum to name a few. 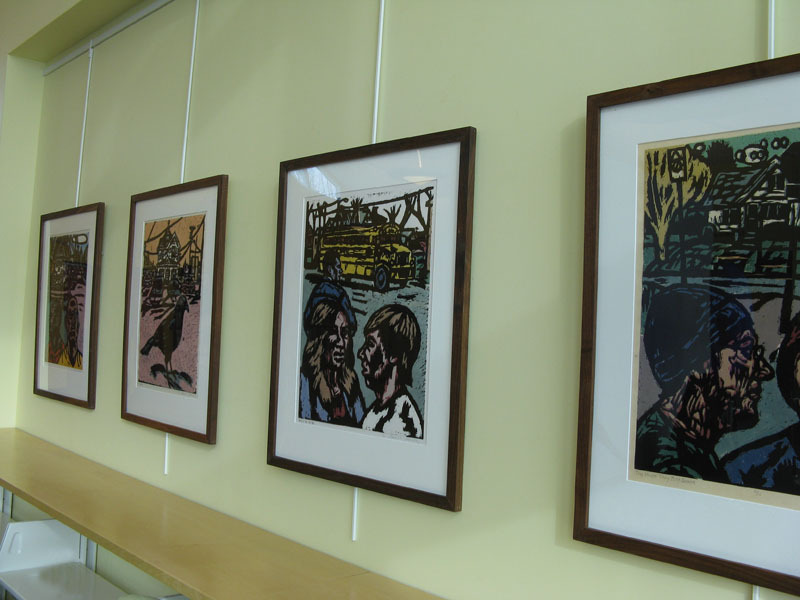 The present exhibition at Kennedy Library includes selections from an ongoing series of linocuts comprised of views of Middletown (Muncie) and its residents. 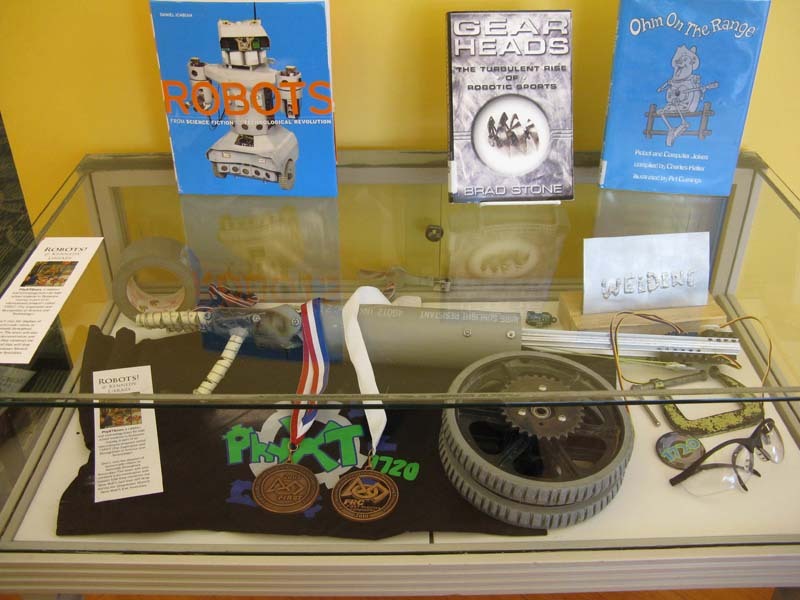 Don’t miss the Muncie Robotics display at Kennedy Library this month! Honor a loved one who served or who is currently serving in the military. 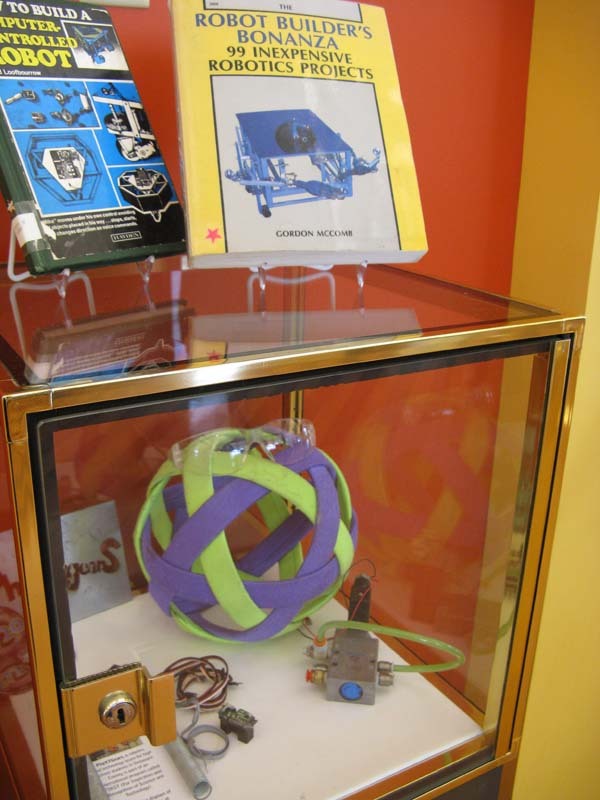 Make an ornament at home and visit either Library location to place it on the tree or you can visit either Library to make your ornament with the supplies on display and place it on the tree. You can also write the service person or veteran’s name and any other details you would like to share in the Heroes’ Album. The trees and ornaments will remain on display through Veteran’s Day on November 11. 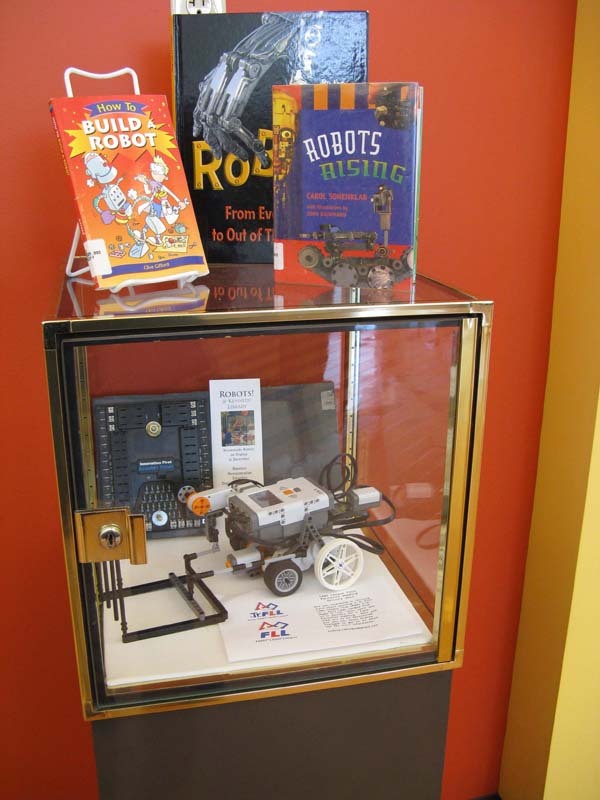 Help Muncie Public Library honor our past and current service men and women. Ornaments may be picked up after November 11, but cannot be mailed or returned to individuals. Please do not use irreplaceable items or photographs in making your ornament. Need Help Signing Up For Food Stamps and Other Benefits? Need help filling out the right forms to get help? Muncie Public Library is working with Team Work for Quality Living and EPIC to open a V-CAN (Volunteer Community Assistance Network) Center beginning Monday, October 6. What’s a V-CAN Center? Individuals and families can sign up for food stamps, TANF, and other benefits. Trained volunteers will be on hand to assist with the forms and help people file them correctly. Parlez-vous français? Vocè fala Português? Sprichst du Deutsch? Which one of these or one of 19 other world languages would you like to learn to speak, right at your computer, for free, using your Muncie Public Library card. I was amazed when after I had spent money to buy a well-known language course, I found out I could have just dialed up the Muncie Library Information at 747-8204 and been put in touch with a way to accomplish one of my “bucket list” dreams! Let me introduce you to the spectacular “Mango Language Site.” I didn’t even know it existed until I needed to order the next language course from the company with whom I had been studying. It was going to be an expensive investment just for the second level. My finger was poised to dial the proverbial 800 connection to place the order when suddenly I remembered ‘back in the day’ the library used to have large shiny ebony 33’s. But by now I knew to ask for CD’s of Brazilian Portuguese. No such luck, but that’s when I discovered this incredible treasure: a language database (through the Muncie Public Library site) for learning a language that is as good as the famous (and expensive) course of study! After you sign in with your library card number, establish your user name and password you can choose the language or languages you will concentrate on from the list depicted by pictures of the countries’ flags. (A good way to associate and learn international flags) Most of the languages have two levels: Basic and Complete, all spoken by native speakers. The sessions are designed to teach by using color-coded words complete with visual and audio pronunciation playbacks of individual words, phrases or complete sentences. (The site even allows you to time your responses and keep track of your progress; it also provides cultural notes and makes translations of foreign texts.) This color-coded method is presented in chapters beginning with: greetings, gratitude phrases and small talk. You have the option of listening over and over to a word or a phrase by continually clicking the mouse until you can capture the subtle nuances of new sounds setting off multiple neural synapses. You will proceed at your individual pace to the next chapter or feel the need to repeat previous chapters as quickly as you process and own the new information. Eventually you will be able to chain words together and amaze yourself by speaking another language. Susan Fisher, an employee of Muncie Public Library, adds the note that, “Anyone can use the Mango system with or without a library card by using the open computer labs at any library location.” She said that since the program is audio, users in the computer lab would need to provide their own headphones or earbuds and would need to repeat the phrases quietly so as not to disturb other computer users. “This could make the Mango system accessible to anyone, even those without a home computer,” she said. To try Mango Languages click here… and select “Library and Home” at the end of the paragraph describing Mango Languages. Effective July 8, 2010 all holds and reserves will now be held for THREE days before being cancelled. 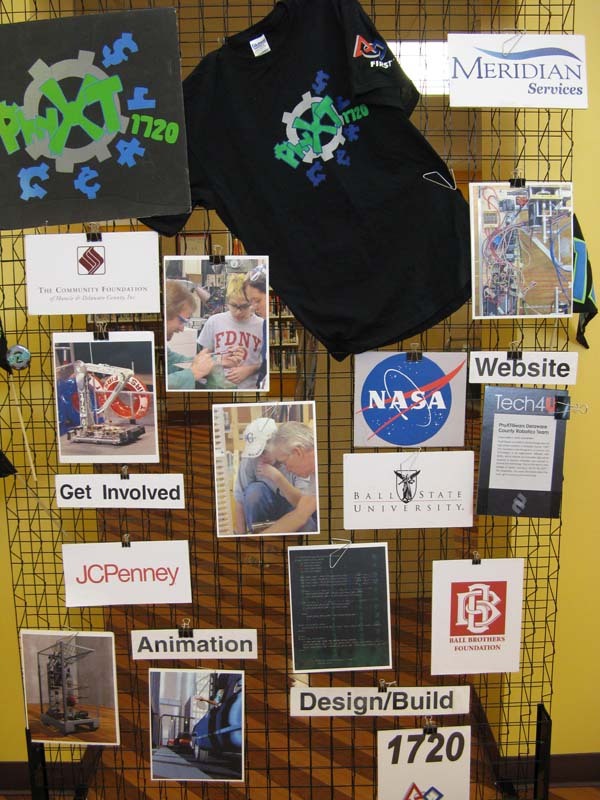 This will allow popular and in-demand materials to circulate more quickly and will serve as a cost-cutting measure for the Library. Because of this change, postal mail notices of reserved and held materials will no longer be sent. Please provide a phone number and/or email address at one of our locations or using this online form so we can notify you promptly when your materials are ready for pick up. Thank you.